TomTom complements JobFlow to make life easier and less stressful for mobile operatives and uses their time and their vehicles most efficiently..
TomTom's vehicle tracking solution delivers the real-time location of every vehicles movement in your fleet. This allows you to adapt quickly to new developments and make smart, informed decisions. 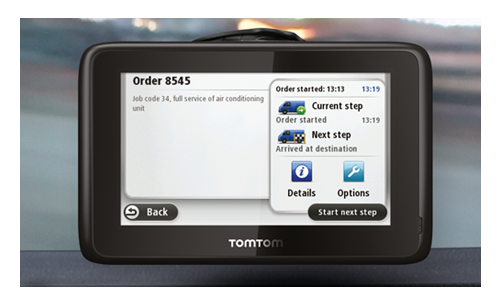 Jobs allocated by JobFlow can be sent directly to your operative’s TomTom screen for them to accept with one touch commands. Once accepted, TomTom provides accurate navigation to your client’s site taking into account TomTom HD traffic at the agreed time, using postcode data directly from JobFlow. TomTom provides simple and clear reporting on your vehicles. It generates automatic logbooks, trip reports, mileage reports, working hours reports and more. TomTom’s ecoPLUS™ provides useful reports on fuel consumption, CO2 emissions and engine trouble codes, enabling you to run a greener business and drive down your operational costs.